This year’s National Prescription Drug Drop-Off Day will be held on Saturday, May 21, 2016 from 10-3 in front of Hill’s Pharmacy Downtown 35 Talbot E in Aylmer. 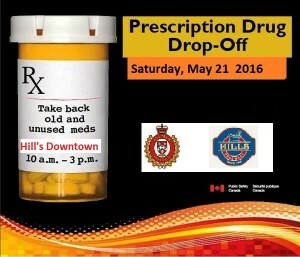 The goal of this annual event is to reduce risks by simply asking that Canadians dispose of their unused and unwanted prescriptions in a safe and responsible manner. The rising rates of recreational misuse of prescription drugs by youth, in particular opioids, can lead to addiction and unintended, tragic consequences. We can all play a role in safeguarding our families just by clearing out our medicine cabinets. This website has been Beard Approved by Redding Designs Inc.